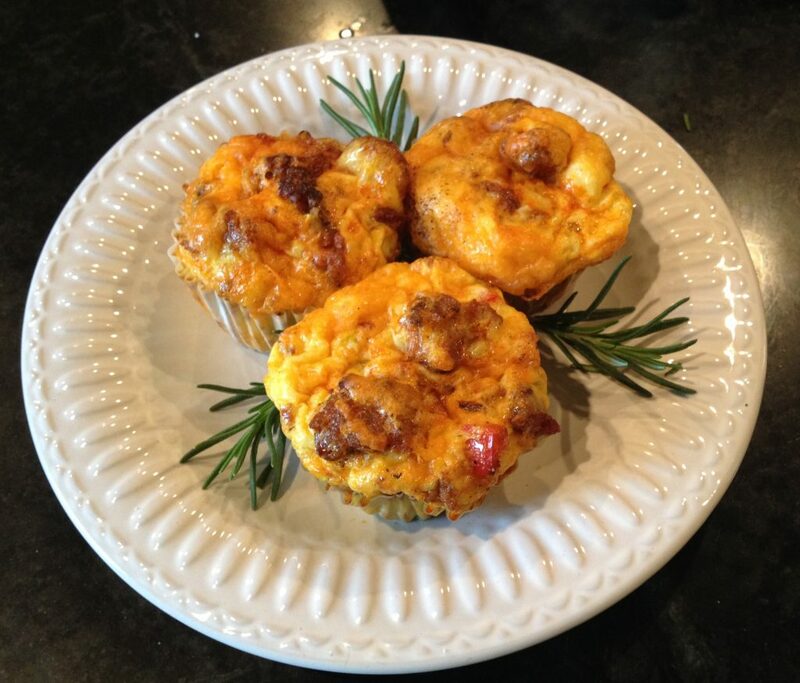 What is great about this recipe is the way you can make batches of these keto sausage egg muffins ahead of time. Meaning these are always there as a quick healthy low carb breakfast. These savory muffins store really well in your freezer, and because they are small they defrost very quickly. Also, I have used these as low carbs snacks if feeling really hungry between meals. They are also a boon for a busy family as they can make up part of a packed lunch for work or school. 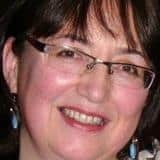 Although this recipe states to use spicy turkey sausage you can actually use any sausage that you fancy, so long as it is a low carb sausage. Another alternative would be to use ground meat instead. Brown sausage in large skillet over medium-high heat, breaking the sausage down into small pieces, as it cooks. Cook all the way through until nice and brown and beginning to crip a little. Drain away any excess fat. Crack eggs into a large glass bowl and beat thoroughly with a whisk. Add cooked the cooked sausage, onion, ½ of the shredded cheddar cheese, red bell pepper, oregano, salt and pepper and mix together thoroughly. Line a cupcake tin with paper cupcake liners and scoop ¼ cup of egg mixture into each container. 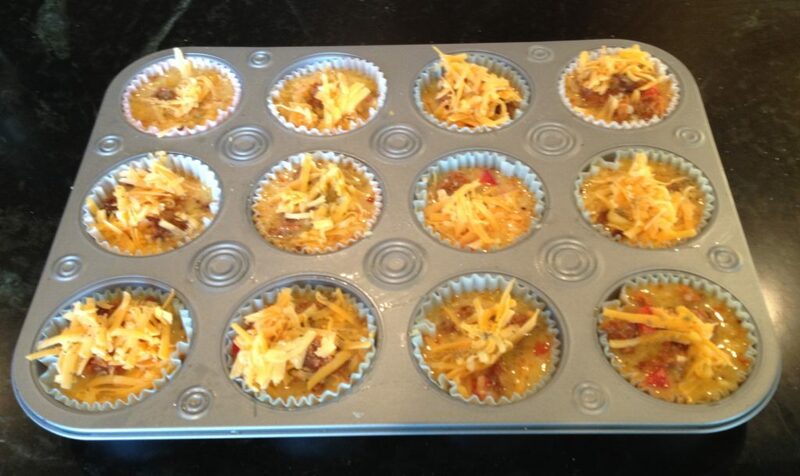 Top each “muffin” with equal amounts of the remaining cheddar cheese. Place in oven and bake for 20 – 25 minutes. Remove from oven and serve immediately or cool and place in a freezer-safe bag to freeze for later use. Yields 15 medium-sized muffins. 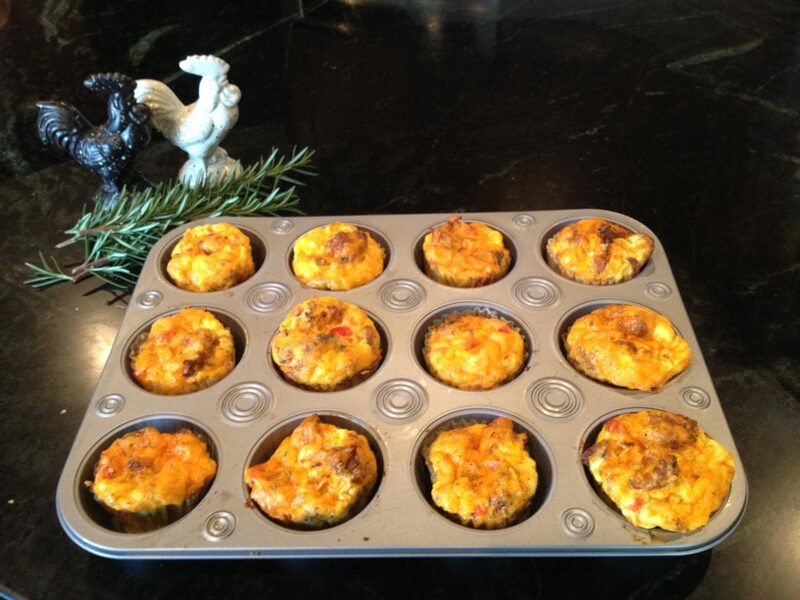 As you can see its very easy to make keto breakfast muffins here are some other variations on breakfast muffins you may like to try. I just love the way the ham is used as a liner for these egg and cheese cups, saves having to buy cupcake liners. Follow along with this simple breakfast muffin recipe, make plenty so you always have a quick and convenient low carb breakfast or snack. Bacon and egg for breakfast what could possibly be better than that? In this recipe, there is some broccoli added to make a delicious healthy breakfast.